A new, free riff to learn this week! We’re venturing into the world of English Progressive Rock with the most famous 7/4 riff in rock history: Money! Money is taken from the “The Dark Side of the Moon” album, released in 1973, and is faithful to the Progressive Rock tradition with its original structure in seven time. This was the only track from the album to enter the US Billboard Top 20 at the time. It was composed by Roger Waters, the bassist with Pink Floyd, and does not present any notable technical difficulties. Nevertheless, be careful to play the dead notes (“x” in the tab) and the palm mute passages properly to make the riff groove in the style of Dave Gilmour. 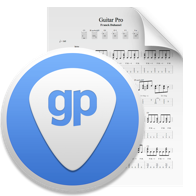 Where the rhythm is concerned, if you find yourself getting lost during the 7/4 measures, feel free to use the Guitar Pro 6 metronome at first to help you keep track properly throughout the riff. Did you enjoy this extract? Learn the whole tab for Money at mySongBook.com.